Fire District 7 firefighters battle flames on roof. Photo courtesy of Fire District 7. Fire Incidents: 39 incidents (61%). Upon preliminary review of the 64 fire incidents to which Fire District 7 was dispatched, 22 incidents were likely caused by fireworks. Further review and analysis on total dollar loss and actual fire cause is currently being conducted. There were no firework related injuries reported. At 9:23 pm on July 4th, Fire District 7 was dispatched to a report of a tree on fire next to a residence at the 20100 block of Old Owen Road. When fire fighters arrived on scene they found that the fire had spread to the attic. Crews worked to knock down the fire and contain it to the attic. Old Owen Road was closed to through traffic for approximately two hours. The residents were not home at the time of the fire. No injuries were reported. At 1:11 am on July 5th, fire fighters were dispatched to a report of a grass fire started by a firework at the 6400 block of 123rd Ave SE. When crews arrived on scene they found a slow-moving fire with active flames. Crews quickly pulled a hose line and extinguished the fire. 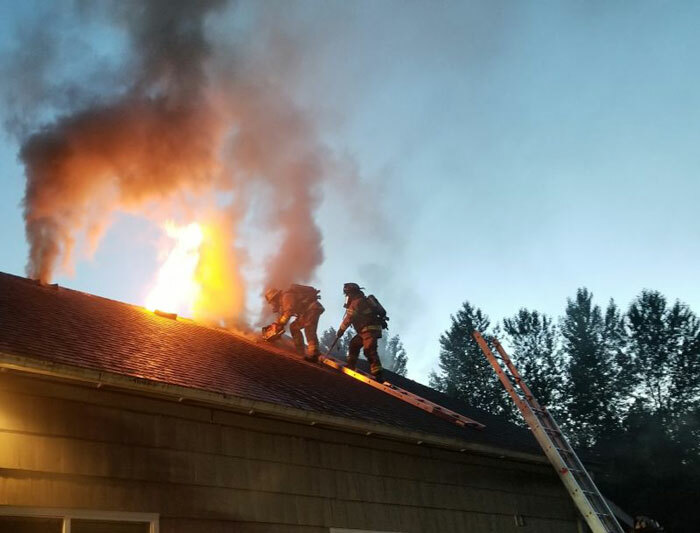 Fire District 7 first responders battle house fire in Monroe. Photo courtesy of Fire District 7.